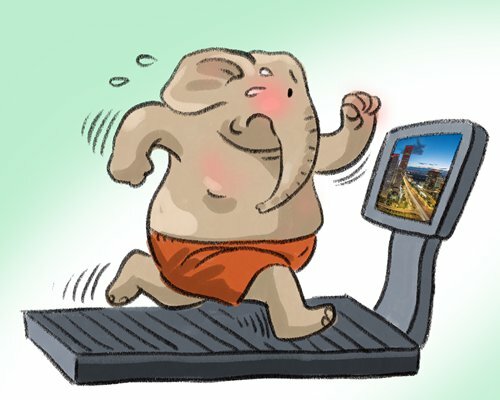 Does India mirror path China took decade ago? I arrived in India for the first time a week before the New Year. But the scenes on the street - the overwhelming nature of narrow streets fought over by a mix of cars, motorcycles, tricycles with engines, bicycles and pedestrians dashing out into the center of traffic every now and then - reminded me of something in my past. The same with the ubiquitous food carts and their owners, who hand you all sorts of tasty snacks and accept worn-out bills with the same bare hands. Add in hustling from vendors, the litter on sidewalks; and most importantly, the unmistakable hunger for economic progress etched on people's faces. It was all so familiar. Yes, they are from a memory of China 10 to 15 years ago when my home country had just been on a rapid ascension to becoming the biggest manufacturing center in the world, an attractive location for international brands to establish their factories and a magnet for wealth accumulators. But now with China's economy trying to transition from a labor intensive model to an innovation driven one, I see great potential for India to catch up by following the route China took. This country has something China once had but can only envy now, a rapidly growing and young population and extremely low labor costs. With a population of 1.3 billion, one fifth of the world's total, India is still the No.2 most populated country in the world behind China's 1.4 billion. But with annual population growth rate of 1.1 percent, compared with China's 0.4 percent, it's expected to become No.1 by 2024. The median age of Indians is only 26.7, about 10 years less than the Chinese. And average labor costs in manufacturing are much lower in India, though by how much is a matter of debate. The lower labor costs are apparent in daily life here, sometimes in an astonishing way. As you check out at a supermarket, there will be a cashier, a packer, a multitude of people to offer you samples of goods for sale, and security guards to check what is in your bags as you leave. At the gated residential complex I am staying at in Delhi, there is a guard at the gate to mainly lift and lower the barrier bar manually so people and cars can go through. On my way from Delhi to see the Taj Mahal, most of the rest stations serve great 30 cent tea in nice disposable clay cups for environmental reasons, a luxury that you wouldn't find in the US. My driver told me the cups, with simple patterns engraved on them, are all handmade and the cost is minimal. No wonder in an interview in April 2018 with the Economic Times, Bain & Company's worldwide Managing Partner Manny Maceda said that Indians don't have to worry about their jobs being replaced by AI as blue collar workers in many other countries do. "India has a big advantage because of its wage arbitrage," Maceda said. "Even cobots or robots cost about $4 per hour. In India, the average factory worker gets paid less than $2 per hour. It's an area that you can capitalize on for growing manufacturing." The Indian government knows this. Prime Minister Narendra Modi has launched the "Make in India" program, aiming to make India the fifth largest manufacturing country in the world by the end of 2020, and seeking to add 100 million new jobs by 2022. He wants to increase the share of the manufacturing sector in gross domestic product (GDP) to 25 percent from the current 16 percent. But cheap labor itself is not a guarantee for accomplishing these goals. India needs to solve many problems before it is able to unleash its full potential. At the end of 2017, Forbes magazine reprinted an article that Balaji Viswanathan, CEO of Invento Robotics, posted on Quora to answer the question: "Why is manufacturing more expensive in India than in China?" in which the Indian entrepreneur listed six major reasons that stopped India from catching up with China, from inadequate infrastructure to bureaucracy and gender inequality. But he missed an important factor: air pollution. The first week I stayed in Delhi, the air quality was at a hazardous level almost every day. Indeed, Delhi is now known as the most polluted major city in the world by many foreigners. Beijing went through this phase. But the smog got really bad in China when its manufacturing sector was already top of the world, and largely because of that. That is not the case in India - the pollution appears to be coming from a multitude of sources from vehicle fumes to winter fires by people seeking to keep warm, and crop burning, coal-burning power stations, industrial emissions and construction dust. Oh, and even fireworks. That makes it a tough sell for expats, especially those with young families. And poisoning your workforce doesn't make much sense either.